DESCRIPTION Heart cut with slits in which strips of colored paper are woven. DETAILS Cut a heart from a heavy sheet of paper. Cut narrow strips of paper from a different colored paper. I used colored wrapping paper with a gloss. It was pliable and easy to weave. With a craft knife cut slits in the heart (A). Don't go all the way to the edges. 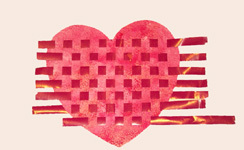 Weave the strips through the slits, pushing them to the top of the heart. Alternate the strips - the first one over/under/ the second, under/over etc (B). You can add to this project by making your own papers. See TEXTURING PAPER. The age of the child will determine how much you are going to prepare for them. Since the weaving requires manual dexterity, don't push it if they get frustrated. The final Woven Heart is shown in view (C).